The fort Vairatgad is situated in the province of Wai, and 8 km away from Wai. It takes one day to see the fort. Travelling has become easy due to regular bus service and private vehicles to the base of the fort. King Bhoj of the Shilahar dynasty built Vairatgad in the 11th century. During Shivaji�s period the fort was used only as a military station. 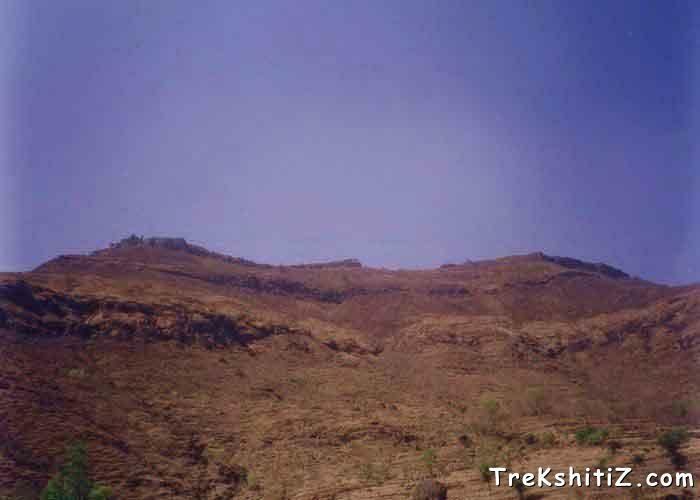 Shivaji Maharaj conquered the Wai region and included Vairatgad and Pandavgad in his kingdom. The British captured it in 1818. Top of the fort is actually very small. There are remnants of old buildings. The bastion at the entrance is dilapidated. One can see 5-6 cisterns to the left of the main gate, on the lower side of the cliff. There is a small cave to the right. Climbing up 20-25 steps further, we reach the top. To the left there is Hanuman temple. Even outside the temple there is an idol of Hanuman. Plinths can be seen in surrounding area. The rampart is still in a good condition. One can climb down to the village Mhasava from a gap in the cliff opposite to the main entrance. There is a hillock near it & on a stone there are some indecipherable writings. Further search might reveal some more interesting discoveries. It takes approximately one hour to see the fort. One should alight down at Kadegaon bridge, 4 km away on Wai-Satara road. From Kadegaon bridge come to village Vyajvadi. There are two ways to reach to the fort from the village of Vyajvadi. The way frequently used takes more time. The other one goes from the left side. It takes half an hour to reach the fort by the latter way while the first one takes one hour. Both ways meet after some distance, from where it takes only 10 minutes to reach the top of the fort. The last part in this path is quite slippery. To the opposite side of Vyajvadi, there is a village by name �Mhasava�. There is away from here, but very slippery. 8 to 10 people can live in the Hanuman temple. Disciples of Gagangiri Maharaj reside on the fort and can make food for two to three people.